Let us take a journey back to October 2012. LeBron James was facing the largest crossroad of his career. One direction led to NBA legend — the mountain top which featured names like Kareem, Bird, Magic and Jordan. The other was the often stigmatized good, but not great, title thanks to the “NBA ringz” culture. James’ newly formed super team in Miami was soundly defeated by the Dallas Mavericks. The Heat and James’s declaration against the NBA of “…not six, not seven” became cannon fodder for the hordes of non-believers. What did LeBron James decide to do? Work on his three-point shooting? Improve his speed and conditioning? While there is now doubt those skills were practiced, James knew what needed to be done, and he derived the information from Sun Tzu’s Art of War. After the Finals performance against the Mavericks, it was apparent a shift in approach was needed. James often deferred to teammates to the detriment of the team. A player of his skill and God-given skill has the ability to win games on his own. To many, however, it seemed the stage was too big for James, leading to his poor play. Of course, we know what happened next. James took that next step as a player and leader. The NBA watched in horror as James won his first title. James’ evolution as a leader being one of, if not, the key factor in the Heat winning a championship. The contrast between year one Miami “Heatles” and year two was blatant. James’ disregard for outside noise and opinion brought forth a more efficient player. His understanding of what it truly means to lead a team was paramount in Miami’s five-game series against the Oklahoma City Thunder. Russell Westbrook has quite the summer ahead of him. That doesn’t even include things that are out of his control: Paul George’s future with the Oklahoma City Thunder. What will Sam Presti do in order to improve the team? Westbrook would be the first to tell you that these are the least of his worries. What should the (currently) reigning-MVP worry about? There is only so much a dynamic, athletic-supernova of a point guard can improve upon. “Always like to put my game into perspective and try to figure out what I can do to be better,” Westbrook said at his exit interview. Presti knows that Westbrook will come back a better player. 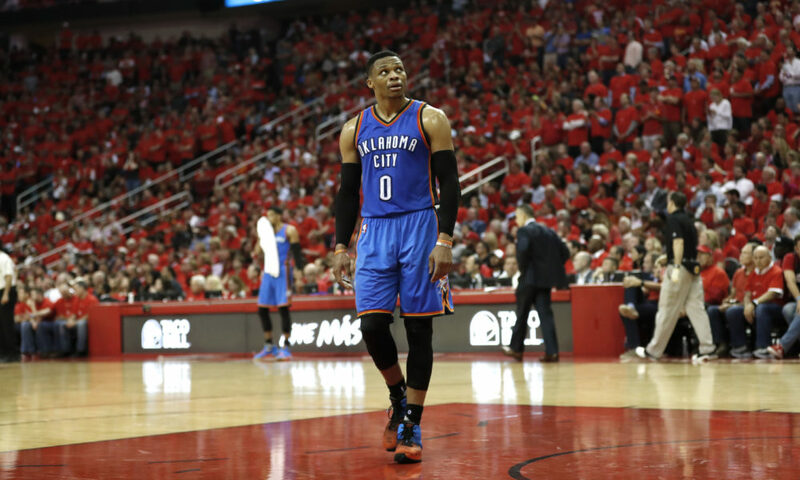 It is easy to bet on Westbrook going back to the drawing board to an extent. But if Oklahoma City is going to take that next step as a title-contending franchise without or without George, it will come down to how Westbrook evolves as a leader. Like LeBron James, Westbrook is the only other player who can do all the things physically to win a basketball game. Kawhi Leonard doesn’t have the speed Westbrook possesses. Steph Curry cannot out-physical opponents like Westbrook can. In the upper-echelon of NBA players, James and Westbrook stand alone in terms of their physical skills. If Westbrook can take the similar look in the mirror that James did in the fall of 2012, the Thunder could in turn take the next step. The DNA of a leader is hard to attain but clear as day when you see it. Westbrook already has the necessary attributes to be one of the league’s greats in this category. The passion, the drive and determination to go along with those physical gifts. One of the more important attributes is self-awareness. Westbrook has shown to have this as well. In 2017, Westbrook spoke about the little things he had worked on. Noticeably how he would act when a teammate would miss a shot or turn the ball over. 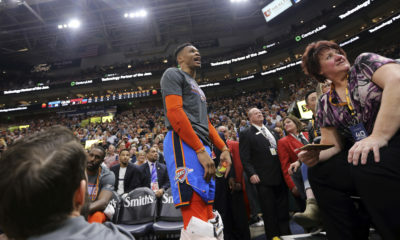 Westbrook understood his fiery personality negatively affected them. This past season was a trial of self-awareness. Early on, Westbrook was passive and the antithesis of what makes him so special in order to work in George and Carmelo Anthony. This came to a head in the loss to the Orlando Magic when Westbrook was seen after the game sitting on the bench alone in disappointment. From that point, he returned to his usually spectacular self. 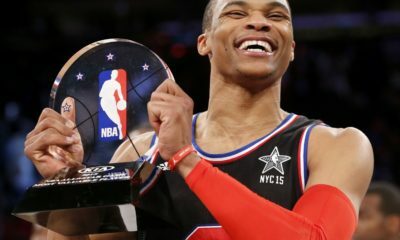 While the 2017-18 Thunder never reached their potential, Westbrook was awarded with a mirror. Westbrook’s multiple roles as a leader have included the Batman/Robin dynamic with Kevin Durant. The triple-double MVP king of 2016-17 and now a disappointing output with two other star players. This is an opportunity for someone like Westbrook. A player who is self-aware, intelligent and possesses the physical skills. There is now a body of work that proves Oklahoma City cannot reach the mountain on Westbrook’s physical skills alone. Will Westbrook do this? We will find out. The important thing to remember is that he is capable of evolving as a leader. Knowing when to defer, when to be fiery or calm. Understanding the development of younger players and instilling in them the confidence of a savvy veteran pays dividends in the post-season. Something as simple as letting go. 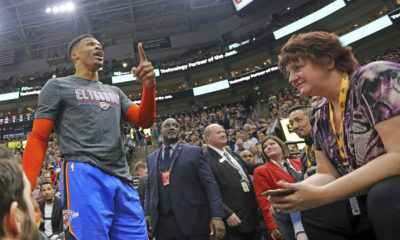 “It’s my job to do everything,” Westbrook said on the final day of the regular season back in April. Many took this quote and used it as the thesis statement in their reasoning for why Westbrook can’t succeed. While that belief is drenched in hyperbole, there is some truth to it. The Russell Westbrook show featuring the Oklahoma City Thunder can only go so far. If he can make that next step as a leader, the Thunder will in turn evolve as an organization. Whether this hinges on him altering his game or approach is for him to decide. The disappointments of 2017-18 can act as Westbrook’s reevaluation spring board. This is all up to the man himself. Continue down the path of individual success but falling short of serious title contention or evolve and reach the mountain top. James was able to do it, Westbrook can too.